Since 1995, we have permanently protected or facilitated the protection of more than 9,000 acres of land statewide. This includes family farms and forests, a private community nature preserve, improved public access to rail trails, and six public nature preserves – one of which boasts six miles of river frontage in the Gauley River Canyon! At the West Virginia Land Trust we look to create projects with meaningful and lasting benefits. We often begin with a recreational opportunities but they lead to additional opportunities as well… this might include drinking water protection, wildlife habitat, local food production, youth engagement, research, and other involvement from the community that reflects the needs of the places we work. 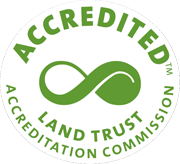 We protect land through a variety of ways, including: 1) placing permanent conservation easements on properties; 2) purchasing land through real estate acquisitions; 3) accepting land donations; 4) administering grants and loans to partner organizations; 5) providing technical assistance to landowners interested in managing their property more sustainably; 5) educating and informing the public about land protection tools; 6) supporting the development of laws and regulations that promote and benefit land and water conservation; and 7) convening and facilitating partnerships that build the capacity of communities throughout West Virginia to protect our state’s land and water resources.